I have been asked to do a guest blog here at Beauty In Ruins regarding my writing. Specifically, I've been asked to discuss my writing and how it has changed over the years and equally important how working in an established universe is different from creating one of my own. I’ll see what I can do to come up with a proper answer. On the first front, let’s look at how my writing has changed and why it has changed. The why is easy enough, actually: I’m a seat of my pants writer. That means that I don’t actually outline much of anything. It also means, in my case at least, that I started out without many preconceived notions about how things are supposed to get done. I did not go to school to become a writer. Heck, let’s be honest here, I barely even finished high school. Seventeen schools in twelve years of schooling basically meant I was walking around with my nose in a book and ignoring the world around me as much as possible. The end result of those years spent not doing my homework more than absolutely necessary was that I read a great deal of fantasy fiction—everything from Piers Anthony’s XANTH series to Roger Zelazny’s CHRONICLES OF AMBER and bloody near everything in between—and that I had to teach myself the rules of grammar a couple of years later. I had help, of course. A very good friend of mine who was also an English teacher at the time suggested a handful of books and I read them voraciously and then practiced what they preached. Back when I started I planned on being a comic book illustrator. I did not achieve that goal, but I did have an editor from Marvel Comics point out that I was telling a good story with my very bad artwork. He suggested trying my luck as a writer. Four months later he also bought my very first professional sale. My history in comics is limited. Aside from a love of the medium I managed to sell an eight-page story for THE INVINCIBLE IRON MAN that to my knowledge was never printed. 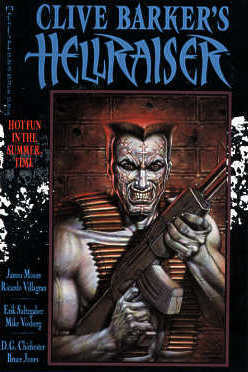 I managed to sell a story the exact same length to CLIVE BARKER’S HELL-RAISER (Issue fifteen, I believe), an issue of CLIVE BARKER’S NIGHTBREED (Issue twenty-three), a script for a comic at the front of a video game that had been licensed to Marvel Comics and I was supposed to take over as the regular writer on both NIGHTBREED and CLIVE BARKER’S ECTO-KID when both series got cancelled. I even got paid for a full script for ECTO-KID that never came to print because the series was canned before it could go to press. My entire education in comic book script writing came down to seeing a copy of the script for the first issue of THE WATCHMEN. Alan Moore’s script was heavily detailed. I followed his style, much to the dismay of a few comic illustrators, I imagine. Aside from those scripts I did a few for White Wolf Games on various and sundry sourcebooks, including the GET OF FENRIS TRIBEBOOK and the NUWISHA sourcebook and a few others. They were always fun and I’d love to do more someday. I got a little better direction when it came to writing for the role-playing games. I did a lot with White Wolf and a little with a few other companies. White Wolf’s editors were good to me and they also taught me a lot about the difference between an active voice and a passive voice. In short, they redlined the sin out of my manuscripts. Working in that particular field also taught me a lot about probabilities. The thing is, in role-playing scenarios. You have to consider all alternatives and write about most of them. The players will not, as a rule, do anything at all like what you might predict. Sometimes I think the come up with new and different angles of approach just to make the person running a campaign go a little crazy, but that’s a story for another time. Do you know what all of those parts have in common? Aside from me writing them? If you said, “They are work for hire,” you are right. We’ll not get into the pros and cons of that right now, if that’s all right with you. Instead I’ll just lay out a quick explanation: Work for hire means you are paid to write something that belongs to someone else. I wrote about Tony Stark/Iron Man and I got paid for it. The work belongs to Marvel Comics. I wrote about werewolves, vampires, demons, demon hunters, fairies, sorcerers and a dozen other supernatural entities for White Wolf Games and the work belongs to White Wolf. I got paid to play in somebody else’s sandbox. Know what else? I LEARNED while I was playing there. I had a chance to push myself on deadlines and I had several very good editors looking over my work and making suggestions on how to make it better. Most of them were spot on, too. For a while I wrote and submitted at least one 1 page outline for a comic story for Marvel Comics per day. About twenty for Spider-Man (because if you’re gonna dream, you should dream big), a four issue mini series proposal for The Punisher (because I thought it would be fun) and a few more besides. At one point I carefully laid out a 24-issue series proposal complete with a detailed outline of the first four issues of the comic and the completed script of the first issue. I spent a good amount of time on it and I sent it off to Marvel and through a series of catastrophic events I might detail for you should we ever meet over a beer, I knew exactly as soon as I paid for the postage that I was never going to have any success with that particular pitch. Rather than write any more outlines I settled down at the computer one day and wrote out a scene that had been bouncing around in my head for weeks on end. Just a quick image of a pudgy kid running through the woods and being chased by a pack of teens determined to beat him half to death. That scene became the first chapter of my first novel, UNDER THE OVERTREE. There was no plot. There was no planning, but, by God, I was writing something other than another outline that I knew would never even get noticed. I liked the idea so much that I spent the next three months writing ever day after or before I went to the day job. Sometimes both. And when I was done, I had an 187,000 word book manuscript. I had no idea what to do with it, but I had written it and it felt might fine, indeed. What I did with it, later on, was edit that bloated mess repeatedly, because the typos and grammatical errors were numerous and the prose was about as purple as a shiner delivered by the heavyweight champion of the world. Sometimes I look back and cringe. Most times I remember that I was doing something most people will never do. I was writing my first novel. I was finishing my first novel. I liked the notion so much, I sat down and I did it again. And then I did it some more. Mostly I wrote about this world. I wrote my own stories, because I had already limited myself to other people’s sandboxes and I wanted to play in my own, with my toys and my own time limits. It was enlightening. The rules are simple. There are no rules, well except the following: Write for you and you alone. Later, if you must you can try to rewrite for other people, but first and foremost write for yourself. Finish what you start. Horror is a different field. I work in this world, I make a few changes and it’s all mine to play with. Fantasy, as I have stated before, is a different beast. I am still learning the rules as it were. I know that building your won world is a lot more complex. I also know that I’m enjoying the heck out of it. I’m liking it so much that I started a new series with a friend of mine. It’ll be fantasy. It’ll be violent and dark. I will likely cackle evilly at several of the scenes I write. And I have no doubt that I will enjoy the heck out of it. I still play in other people’s sandboxes, by the way. I did a story for the ZOMBIES VS. ROBOTS anthology from IDW. I am now working on my third story for the V-WARS series edited by Jonathan Maberry. It’s fun stuff and I love it. And they pay me to do it. And next month I have a novel coming out called ALIEN: SEA OF SORROWS, which is a tie-in to the ALIEN franchise of movies. Believe me, I had a blast. Once I got over the geek factor of working on one of my favorite franchises of all time. The rules are very different for work for hire and I’m okay with that. I enjoy the playing in my sandbox and in someone else’s and in the event that I do not enjoy it, I do not go back. 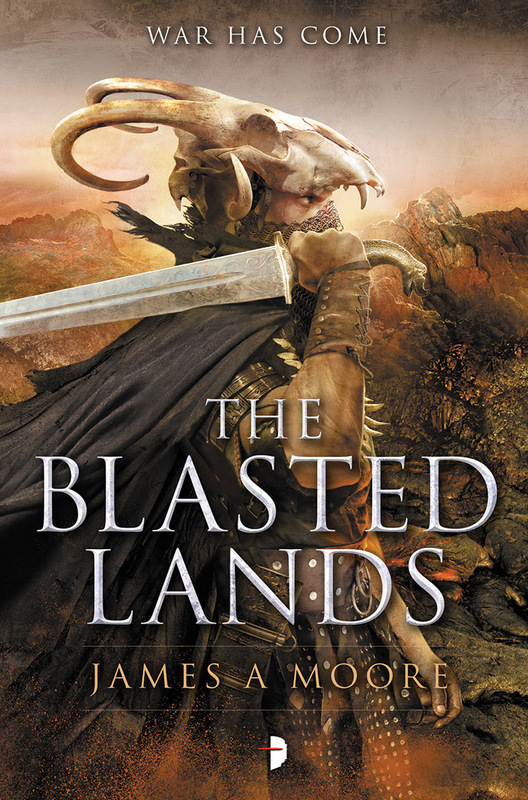 As I am on the second novel in the SEVEN FORGES series, I think you can safely assume I like writing fantasy and building new worlds. Thanks very much for having me over here at Beauty In Ruins! James A Moore is the author of over twenty novels, including the critically acclaimed Fireworks, Under The Overtree, Blood Red, Deeper, the Serenity Falls trilogy (featuring his recurring anti-hero, Jonathan Crowley) and his most recent novels Blind Shadows as well as Seven Forges and the forthcoming sequel The Blasted Lands. 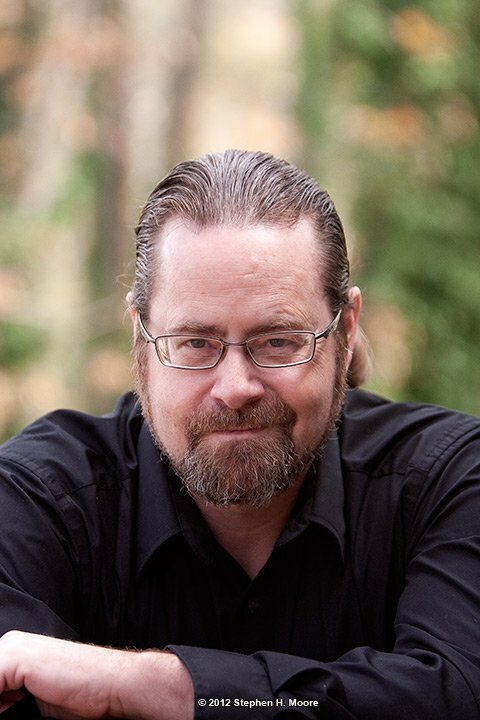 The author cut his teeth in the industry writing for Marvel Comics and authoring over twenty role-playing supplements for White Wolf Games, including Berlin by Night, Land of 1,000,000 Dreams and The Get of Fenris tribe. He also penned the White Wolf novels Vampire: House of Secrets and Werewolf: Hellstorm. Moore’s first short story collection, Slices, sold out before ever seeing print. He currently lives in the suburbs of Atlanta, Georgia. Meet him on his blog.